As Dr. Sethi said, systolic hypertension is a problem, though among physicians and even cardiologist less recognized or of less importance, but more and more it is getting importance and considered as important or probably more important in causing morbidity and mortality in hypertension. This is a typical scenario, I am sure each one of you have seen, people above the age of 60, apparently normal, in healthy condition, just having systolic blood pressure, which is elevated more than 140 and most of the parameters are normal, so the dilemma comes, should we treat it or should not treat it, just leave it alone because this patient is apparently healthy, he has no symptoms, the biochemical parameters are normal, cardiovascular system is normal, should we treat. Now, this is the classification, of course we were looking forward to JNC-8 recommendation hoping there will be some change, but so far there has been a significant delay in the announcement of JNC-8 recommendation. It is almost 1-1/2 years behind schedule, but the latest, the European Society Category as well as the British Society of Hypertension, what is recommended is the optimal blood pressure is less than 120 and diastolic blood pressure less than 80, normal blood pressure less than 130 and less than 85 diastolic, higher normal blood pressure what was earlier called pre-hypertension in JNC-7, that is 130-139 systolic and diastolic 85-89. Now, we are interested today in this aspect, isolated systolic hypertension is again in grade I and grade II. Grade 1, the systolic is 140-159 and the diastolic less than 90 and grade 2 where the systolic hypertension is more than 160 and the diastolic is less than 90. This is what again Dr. Sethi eluded, see what happens as person ages, you see the systolic blood pressure gradually keeps on rising. This is seen both among man and woman where as the diastolic blood pressure up to a level, say about 60 years, tends to rise and then actually comes down. This is a normal phenomenon that is observed in various age groups and ethnic groups in U.S. and with the resultant age of 60, you see there is a widening of pulse pressure both among men and women. This is commonly seen all over, including in India and this is a phenomenon that we are concerned with today, i.e., rise in systolic blood pressure and the rise in pulse pressure. We all know, hypertension is the commonest disease affecting mankind. It is much more common than even common cold or flu. It is said at more than 75 years of age, almost 80% of the people will have hypertension. In older age group, if more than 80-85, you take almost 95% of people you find to have hypertension, it is that common. I mean, almost everybody, that means almost everybody in this audience also of the age of 60 or 65, there is tendency for elevation of blood pressure uniformly and by the age of 75, almost 80% of the group here will have hypertension by definition and that is the enormity of the problem as well as the situation. Again, this shows by age, if you see, more than 80s predominantly it is systolic hypertension whereas between 40-50 years, there is a combination, majority having both systolic and diastolic hypertension. Now, this is the issue, actually this is the relation of stroke versus the diastolic blood pressure and this is the relation of stroke with systolic blood pressure. Actually, we do not see any difference at all. So, in our old concept that diastolic blood pressure was important and systolic was not important and most of our focus was on controlling diastolic blood pressure and the teaching was that the diastolic blood pressure causes increases in stroke, tend to reduce isolated blood pressure, but we really see here the incidence of the stroke increases with higher, not only related to the age as well as the level of the systolic blood pressure and this relation is same that you see in diastolic blood pressure, emphasizing that isolated systolic hypertension is as important, more important in the cardiovascular mortality. This is of course in the coronary artery disease, ischemic heart disease, mortality, same thing you see this is the systolic hypertensive group and there is a diastolic hypertensive group, you see the similar curve or association in systolic hypertension and coronary artery disease and diastolic hypertension and coronary artery disease. 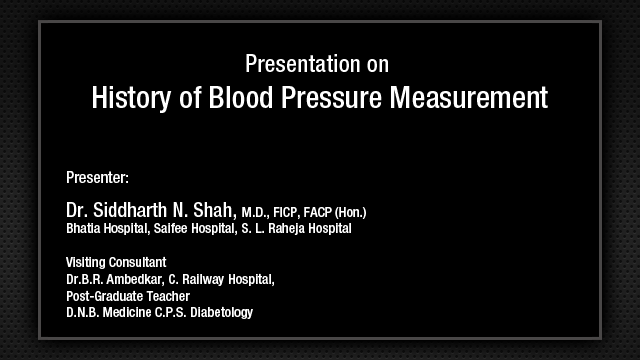 Now, this shows the relation of systolic blood pressure and the pulse pressure, you see, higher the pulse pressure higher the systolic blood pressure, higher the hazard ratio for coronary artery disease, all this clearly indicate that systolic hypertension has a definite relation for stroke, coronary artery disease, morbidity and mortality. Now, there is an issue about so-called J-curve. I am sure again for more than 40 years this controversy exists. Is there a J-curve in hypertension? While, as shown definitely this was published in 2010, you see the blood pressure, actually over the age, older the age group, if there is a dip in pressure, especially the diastolic below in the range of 60-70 and the systolic around 120-140, definitely the mortality increase. This is an important issue when you are managing systolic hypertension, especially in elderly. There is enough evidence to say that higher the pressure, higher the morbidity and mortality. At the same time one should not bring down the blood pressure too low because then the mortality and morbidity increases. There is a J-curve phenomenon in this. SHEP, one of the landmark trial that clearly show that systolic hypertension is associated with increased morbidity and mortality also showed managing systolic hypertension by medication significantly reduces the morbidity and mortality, that is, the systolic hypertension in the elderly program also called SHEP trial published in 1996 wherein 4736 men and women who were 60 years and older at baseline with isolated systolic blood pressure of more than 160 and a diastolic less than 90 at baseline, of this 580 people were actually diabetic and about 4149 patients were nondiabetic. So, there were patients with isolated systolic hypertension and some of them were diabetic and these people were followed up for 5 years. The active treatment group received a low dose of the chlorthalidone, 12.5 to 25 mg per day, with a step up to atenolol. In case the blood pressure was not controlled with chlorthalidone, they allowed addition of atenolol or reserpine at that time as needed and a 5-year major cardiovascular death rate was measured and what they found is, it was the CVD rate was 34% less for active treatment group compared with placebo for both diabetic patients as well as for non-diabetic patient. So, in all patients, high risk associated with diabetes and nondiabetic, just adding chlorthalidone and reducing the systolic hypertension brought down the mortality by 34% in these patient with isolated systolic hypertension. This slide clearly show the major cardiovascular event rate was significantly less in the active group, both in diabetic patients and nondiabetic patient, non-fatal and fatal attack events were also significantly less in the treatment group compared to non-treatment group. Non-fatal MI and coronary artery disease was much less in the treatment group. So cardiovascular events were much less in patients who are treated with chlorthalidone. Another trial, Systolic Hypertension in Europe, i.e., Syst-Eur Trial published in 1997 wherein 4695 patients were randomly assigned to nitrendipine, a dihydropyridine, 10-40 mg daily with possible addition of enalapril 5-20 mg daily and hydrochlorothiazide 12.5-25 mg daily or matching placebos. Among elderly patients with isolated systolic hypertension, anti-hypertensive drug treatment starting with nitrendipine reduces the rate of cardiovascular complication. Treatment of 1000 patients for 5 years with this type of regime may prevent 29 strokes or 53 major cardiovascular endpoints. I mean this clearly shows that the next class of drugs, i.e., dihydropyridines were also effective in reducing morbidity and mortality. This is the Kaplan–Meier curve in which you can clearly see the placebo group had a much higher incidence of fatal and non-fatal stroke as well as fatal, non-fatal myocardial infarction compared to the active treatment group, clearly showing that treating hypertension significantly binged on morbidity and mortality. In 2007, the meta-analysis comparing more than 30 such trials clearly showed that treatment with any anti-hypertensive medications systolic hypertension brought down the cardiovascular morbidity and mortality by 34%. This was a very big meta-analysis that was done on systolic hypertension. Now, there was always an issue. Fine, we treat systolic hypertension in a younger age group or let us say 60 or 70, but till recently it was not very clear what about very elderly patient, above the age of 80, because many of us feel, you know the old of formula that all of us have used that 100 plus the age is a normal blood pressure for person, so if person is 75 years, 175 was considered to be a normal blood pressure for the person and people always had this issue, at the age of 80 should we really treat these patients aggressively or just leave them alone, because older age group management, these patients have multiple problems. Whether aggressively treating hypertension will give you benefit. HYVET trial is a one trial, which looked at very elderly patient, more than 80 years of age, with isolated systolic hypertension and treated with diuretics and followed up. This study had to stopped after 2-1/2 years because they found that there was a significant difference in the morbidity and mortality and they recommend that even after 80, there is a benefit and the benefit that is seen in treating these patients was as good as treating a younger patient, so similar benefit was achieved. So, it is very clear now that even patients above the age of 80, one should treat isolated systolic hypertension. The only problem with HYVET trial is that the patients who were included were very healthy. They did not have any comorbid conditions. They were not sick. They were very healthy 80 year old. Now, this trial showed that in such group of patients who tolerated the anti-hypertensive medication, they did very well and morbidity and mortality was reduced. Whether the same thing applies to most of our patients above the age of 80 who are sick who have multiple problems whether they will tolerate anti-hypertensive medication, what is the incidence of orthostatic hypotension and other problems, we still do not know. But, looking at overwhelming evidence of anti-hypertensive treatment in all age groups, I mean for almost now more than 50 years, we have been having evidence about the management of hypertension. Consistently, there is a data to say that treating hypertension in any age group, there is a benefit and it reduces the morbidity and mortality. Applying the same, I think even in those patients who are more than 80 years with comorbid condition, I think there is justification in treating hypertension. Now how do you evaluate this patient has systolic hypertension. The initial evaluation of patient with systolic hypertension should include an assessment for the presence of other cardiovascular risk factors. I think this applies to all hypertensive patient, you are not treating hypertension alone, because most of these patients with hypertension, though it’s a common disease will have other conditions, which increase the risk of cardiovascular disease, one is of course diabetes, second of course the major risk is dyslipidemia, now it is very well known and recommendation that all patient with hypertension should get their lipid evaluated because there is a very common association similar to the common association diabetes, there is a very close link between hypertension and dyslipidemia. So, every patient with hypertension should get his lipid assessed and his dyslipidemia should be treated aggressively as per recommendations. Similarly about smoking, tobacco usage, obesity should also be looked into and reduce those risk factor, so one must look for presence of other cardiovascular risk factor because when we are treating one condition, we should also look at other comorbid conditions, which will also worsen the patient's outlook and aggressively treat those comorbid condition. We should also look at end-organ damage because that alters the prognosis for the patient. Every hypertension patient of course more so with systolic hypertension, more so in the older age group, we must constantly look for any evidence of end-organ damage because that totally alters the outlook for the patient as well as how aggressively we would like to treat this patient group, concomitant disease affecting the prognosis and treatment and identifiable and correctable cause of hypertension. This is again very common. Actually, one of the reasons why isolated systolic hypertension is not considered a serious disease, there are many other conditions, one of the common conditions is anemia. Severe anemia itself can produce systolic hypertension and hence many people do not take any cognizance. Hypothyroidism and hyperthyroidism both are know to produce hypertension. So, some of them can be corrected and they should be corrected. Now, aortic insufficiency of any cause, coarctation of aorta or pseudocoarctation of aorta especially in the elderly all can cause systolic hypertension and they must be treated and they must be looked into, and one should also look at potentially contributing lifestyle factors. Coming to the management, obviously, like any other hypertension, you must concentrate on lifestyle modification; avoidance of smoking, cutting on alcohol, definitely higher the amount of alcohol a person consumes, there is a much higher incidence of hypertension, so one should control alcohol. Obesity is definitely related to hypertension. One should maintain optimum weight. Salt consumption is very well known, higher the salt intake higher the blood pressure, so there must be restriction on salt. Diuretics form the mainstay of treatment. JNC-7 and subsequently British Heart Society, Canadian Society all have recommended that diuretic should be the first line of treatment in systolic hypertension. Chlorthalidone is coming back. There is more on more recommendation saying that chlorthalidone is a better diuretic compared to even thiazide diuretics. Again, in elderly it is of special significance because most of the elderly patients have a tendency for diabetes and we know very well that thiazide group of diuretics worsen diabetes or there is an increase incidence of new-onset diabetes with prolonged use of thiazide diuretics and hence it is preferred that chlorthalidone is used. I see now there is resurgence and actually many companies have restarted marketing chlorthalidone. That is the good thing and most of the recommendations now say that chlorthalidone is a better diuretic. Dihydropyridines are the next choice of drugs, especially long-acting dihydropyridines; amlodipine, cilnidipine. These drugs which have a longer duration of action are ideal. Short-acting dihydropyridine like nifedipine should be avoided because one of the major data that clearly shows that short-acting dihydropyridine drastically reduce the blood pressure, that fall in blood pressure increases the mortality and the morbidity for the patient. So, it is always preferred that one use long-acting or delayed agent or kind of preparations which over a sustained period of time slowly bring down the blood pressure than the short-acting dihydropyridine. Non-dihydropyridines are not shown to be very useful like diltiazem or the verapamil and plus they have lot more side effects. Ace-inhibitors, especially in the PROGRESS trial clearly showed that addition of perindopril with thiazide significantly brought down the mortality. Of course, there is still debate going on in spite of various trials. Many still believe that it is reduction in blood pressure irrespective of the drug that is used is one that causes the beneficial effect rather than a specific group of drug. Though, from the cardiologist's point of view, from the nephrologist's point of view, probably ACE inhibitors and ARB seem to have an edge, but in overall population what is important is controlling the blood pressure; whether you use a diuretic, whether you use dihydropyridine, whether you use ACE inhibitor or ARB what is important is controlling the blood pressure and ACE inhibitors definitely, especially in those group of patients who have multiple risk factor and also diabetes, I think they have shown to be useful and one of the major trial that is often quoted is the PROGRESS trial. ARB’s is longer acting and nephrologists tend to believe that ARBs are better than ACE inhibitors. The cardiologists tend to believe ACE inhibitors are better than ARBs, but I think this debate will go on, but it is a final point, both are good drugs and you can use any one of them. LIFE study showed again that losartan definitely was superior to atenolol in improving the long-term results in hypertension, even the systolic hypertension. Finally, beta-blockers as you can see, they have come way down. Beta-blockers seem to be taking a lot of beating. I mean 3 large trials; LIFE as well as ALLHAT, and LLP, all of them clearly showed that for some unexplained reason, the mortality among patients with beta-blocker was higher compared to patients who are on either dihydropyridines or ACE inhibitors or ARBs and because of that beta-blockers are not the first choice drug, especially in elderly. It has been shown that they are not of much use, especially drugs like atenolol are definitely not recommended now. Metoprolol long-acting or delayed action seem to be preferred, but in elderly or isolated systolic hypertension, they are not the first choice, especially in the city where I come from like Bangalore where there is a very high incidence of allergic bronchitis, they have a problem in using this drug and they have not found really any major advantage. What surprises me is that none of the guidelines mention about centrally-acting drugs. I really do not know. Of course, one of the reasons attributed in all the guidelines and all the trials is that there is a major side effect of postural hypotension and many other side effect of drugs and in elderly especially we know already they have a problem of autonomic nervous system and there is a higher incidence of postural hypotension in elderly and probably these drugs will worsen, but let me tell you, though it is not really mentioned in any of the guidelines, in my own practice, I have found that patients with systolic hypertension respond very well to the centrally-acting drugs. Yes, one should be cautious, there are many side effect, the drug I usually prefer is clonidine, because I found that it has less chance of postural hypotension compared to methyldopa. Methyldopa definitely produces much more postural hypotension compared to clonidine, but clonidine have lot more side effect like dryness of the mouth, drowsiness and major problem is rebound hypertension because especially the elderly, they have tendency for forgetfulness and if they stop the drug abruptly, it can be a rebound hypertension and can have more problem. Most of the guidelines do not mention the role of centrally-acting drug I must tell you, but personally I feel they are good drugs in the management of the isolated systolic hypertension. Alpha-blockers again because of the other side effects, especially postural hypotension, again are not the first line of drug, but in some of those elderly who have prostatic symptoms wherein alpha-blockers have a beneficial effect may be you can use, but not as a primary drug, you can add on in case there is a need for more than 2 drugs and patients has no postural hypotension, may be alpha-blockers can be given. Now, what here is clearly shows is these two, i.e., diuretics-chlorthalidone and dihydropyridines are the drugs of choice in large number of patients with isolated systolic hypertension. These drugs are like specific indication, patient systolic hypertension with congestive cardiac failure; I think there is a role for the ACE inhibitor and ARB. 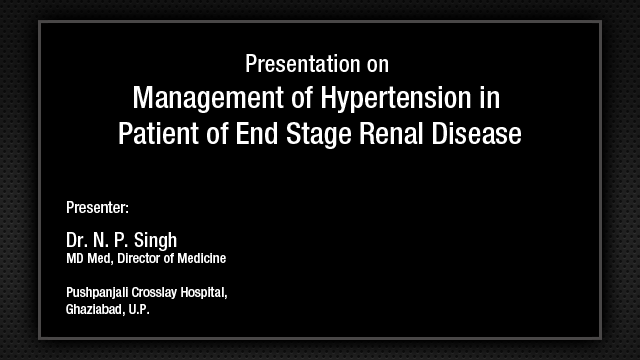 Hypertension with renal dysfunction, maybe there is a role for ACE or ARB along with this. Patients with systolic hypertension with coronary artery disease or angina, I think a combination of this with beta-blockers is useful. I mean as we go down these drugs become, you know, specific drugs for a comorbid condition not the first choice of drug on the patient with isolated systolic hypertension. 1. In the elderly anti-hypertensive treatment is highly beneficial, we have clearly shown that it is useful. 2. In patients age more than 65 years, the proportional benefit is no less than in younger patient. 3. Large meta-analyses do not support the claim that anti-hypertensive drug classes significantly differ in their ability to lower BP or exert CV protection both in younger and elderly patient. That is what I alluded to, many believe that it is the anti-hypertensive effect or the reduction in blood pressure that is important than any specific class of drug unless there are compelling indication. As I said, associated congestive cardiac failure, definitely ACE inhibitors found to be superior compared to dihydropyridines. 4. The choice of the drug to employ should thus not be guided by age. 5. Thiazide diuretics, ACE inhibitors, calcium channel blockers, ARBs and beta-blockers can be considered for initiation/maintenance of treatment also in the elderly. In the elderly, outcome trials have only addressed patient with an entry systolic blood pressure of more than 160. Now, you know we have this group where is the definition of systolic blood pressure above 140. Now, if you treat blood pressure slightly better than 140, 148 or 150, is that benefit seen? The data is still not very clear, but applying the rule that is seen in other hypertensive patients, I think we may presume that treating systolic blood pressure of 150 is equally beneficial. Common sense consideration suggest that also in the elderly, drug treatment can be initiated when the systolic blood pressure is more than 140 with the goal of going below this value. Treatment should be conducted with particular attention to adverse response, potentially more frequent in elderly, especially the postural hypotension, one should be cautious. This is the algorithm that recommended if the blood pressure is very high, irrespective what, we should treat. If the blood pressure in this range group 160 to 100, we should again treat. In this group, 140-159, if there is target organ damage or if there is diabetes, I mean, diabetes has special significance which repeatedly has been shown so even if there is no organ damage, no cardiovascular complication, association of diabetes one should treat, bring down the blood pressure. If the 10 year cardiovascular risk is more than 20%, one should treat this patient. Rest of them should be just lifestyle modification and you know observe this patient, follow this patient and if the pressure goes up, one should treat. 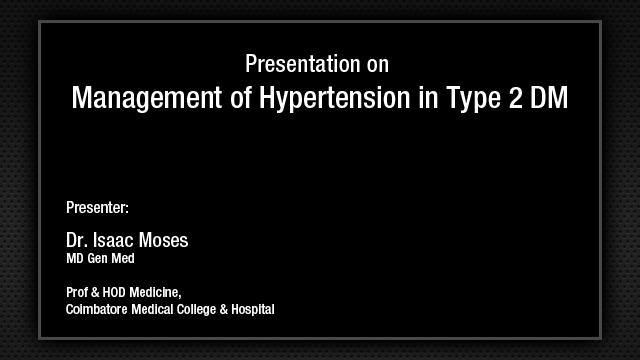 This is overall the management of isolated systolic hypertension.